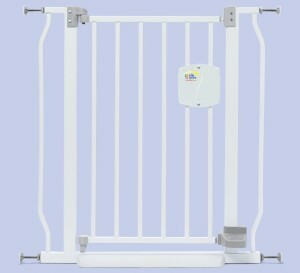 There are dozens of top rated hands free baby gates to select from. 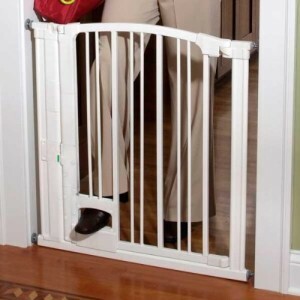 Being a parent means having a great deal of responsibility in your hands all the time and that’s why it is beneficial to use a baby gate that can be unlocked without having to use your hands. Your children will enjoy the safety and security they need, without the gate creating obstacles for you and your family whenever someone has to walk through it. This design is useful if you have children who need most of your attention and you need to have your hands free as much as possible. These gates are simply operated by sliding a foot pedal or pressing on the pedal in order to unlock. The most ingenious part of the hands free design is the fact that it is so easy for an adult to unlock it yet it is completely baby-proof. The step and release system, while being ironically child’s play for an adult, is too difficult for a baby to operate. This design comes as a huge benefit for parents occupied with their young ones and their necessities. 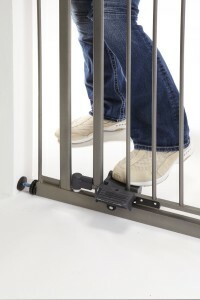 This popular gate is foot pedal operated by pressing on the pedal using your toes and then bumping the knee plate using your knee. This metal gate locks with an audible click after being closed with a simple nudge in the opposite direction. The audible click reassures you that it’s securely shut again. Additionally it can swing open in both directions for easy back and forth movement.It is available as flat topped or arched gate. 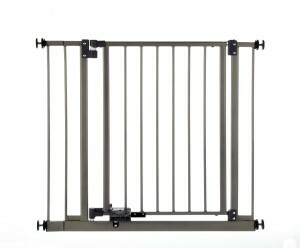 This gate is built to fit in door-frames from 29 to 34 inches, and is pressure mounted with adjustable bolts that will give you a strong sturdy fit, without damaging or scuffing your walls. This gate has extensions sold separately here so that it will be able to fit in larger hall and doorways, giving you the ability to install it in openings up to 44 inches wide. The height measurement are 32.5 inches at the top of the curved section and 32 inches on the sides. Watch the video below for more features. The stylish silver gate with black finish fits doorways from 30 inches to 45 inches wide. It is 32 inches tall. It has dual sided foot pedal. It opens in both directions. It has an auto close feature where the door gently closes behind you. It has an optional grip handle at the top that you can use to open. It is sturdy, pressure mounted and comes in a contemporary design. This steel gate swings open in either direction. It has 2 opening options which include the childproof latch locking system for one hand operation and the hands free operation where you just slide the foot pedal, push it down and then push open. It measures 29 inches high and fits openings 31.25 inches to 38.5 inches wide. 2 extensions are included. It is pressure mounted for easy installation. Tension knobs have been included to secure the gate firmly. This extra-tall and wider gate swings open in either direction. It has auto close magnetic lock and foot pedal opening feature. It comes with a locking color indicator where green indicates that the gate is open and set for use while red indicates it is locked and very secure. It is white in color and features tubular steel construction with non-toxic finish. It is pressure mounted for easy installation.It measures 31 inches high and fits openings 29 inches to 37 inches wide. Optional extensions are sold here separately. 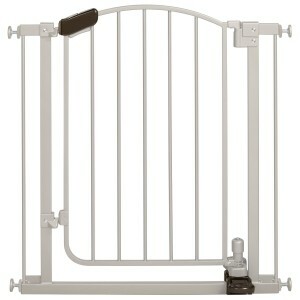 Most of these foot pedal operated gates are ideal for room openings,doorways and bottom of stairs. Ideally most of them are suited for babies from 6 to 24 months because children that are much older may perhaps be able to figure out the mechanism.